Bishnupur is a town in the Bankura District of West Bengal about 132 km from Kolkata. It is famous for its terracotta temples and baluchari sarees. The town has a glorious past that is reflected in its rich architecture, music and handicrafts such as pottery and weaving. It prospered in the 17th and early 18th centuries. Ruled by a line of Hindu Rajas of the Malla dynasty, Bishnupur developed a unique form of architecture and has perhaps the most brilliant and detailed terracotta work in Eastern India that has withstood the ravages of time. The history of Bishnupur can be traced back to 694 AD, when King Raghunath I founded the Malla dynasty. 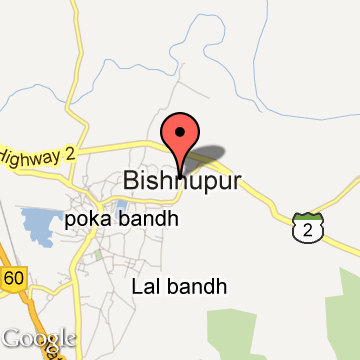 However it was much later in 994 AD that the place was named Bishnupur. The name is derived from the name of the Hindu God ‘Vishnu'. The majority of the people belong to the ‘Vaishnava' sect. Bishnupur is a popular travel destination in the vicinity of Kolkata, capital city of the state of West Bengal. The town of Bishnupur is famous amoug tourists for its historical terracotta temples and baluchari Sarees. The name of the town is after the Hindu Goa "VIshnu". The town is located at a distance of 132 kms from Kolkata. The unique terracotta architecture of Bishnupur temples are of great importance for visitors and signifies the importance given by the rulers of Malla dynasty to art and culture. The main tourist attractions of Bishnupur are its 17-18th century terracotta temples that were built by the Malla rulers. The must visit attractions among these temples are Rasmancha, Jorebangal temple, Panchratna temple and Madanmoharn temple. Apart from these terracotta temples, the Baluchari sarees made of silk are of great interest to travelers. The town also organizes an annual fair, known as the Bishnupur Mela, that attractions large number of visitors from neighbouring regions. Bishnupur Tourism - Get all information on Bishnupur tourist places and sightseeing tours. Our website helps you plan your next tour and gives you great ideas on what to do, where to eat, where to stay and when to go there. We give the best information from the web to give you precise, meaningful and useful travel guide for leading places to visit in India and from across the world. Our travel information on BISHNUPUR tourist places, tourist attractions, major sightseeing, the best time to visit, the top places to visit in Bishnupur, the must-see things to see and do, maps, restaurants, hotels, nearby tourist destinations, local public information and more. To start with check out information on how to reach Bishnupur.